With Local Food Week coming up from June 6-12th, Longo's is on a mission to help us understand exactly which fruits and vegetables are in season during the summer months - so we can enjoy delicious seasonal food. For the past 60 years the Longo's family has maintained a commitment to provide customers with the best fresh and local food possible. I like that local food has gained momentum because of sustainability concerns and consideration for local farmers. 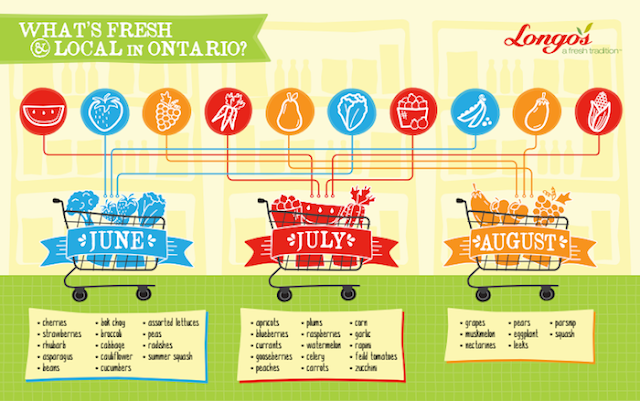 See the above infographic they have created to help us cook with local food this summer. Pluot is a cross between a plum and an apricot and are a summertime favourite at Longo's. The combination is much sweeter and tantalizing that those from which it was created. Coloured and Romanesco Cauliflower gets its beautiful hue, which vary from orange to purple, from the presence of the antioxidant anthocyanin, which is also found in red cabbage. The difference in taste from a regular cauliflower is subtle. It is usually cooked to bring vibrancy and colour to each dish. Moon Cherries are grown in Wenatchee, Washington in high-altitude orchards where the climate is warm, not hot, during the summer months with temperatures dropping at night. This temperature shift builds high sugars and acids in the fruit which helps produce firm and flavourful cherries. The location in which they are grown also shines even brighter in the days leading up to the full moon when the farmer prefers to harvest. These special cherries come in specially marked packs in August. Mini Cucumbers have been in the produce section for quite a few years, but have recently begun growing in popularity as a great snacking product. Great chart! We love eating local and the best time is right now! I eat local as much as is feasible.The taste is always so much better than that which is trucked in from a cross country. I'll have to keep a lookout for these foods! Great chart, printing it off now to refer to! Thanks for the post! We always cook with local food. My mom is a local farmer. The freshness is definitely extra delicious. While I choose my veggies and many fruits local, I tend to think that much of the local movement is inefficient.